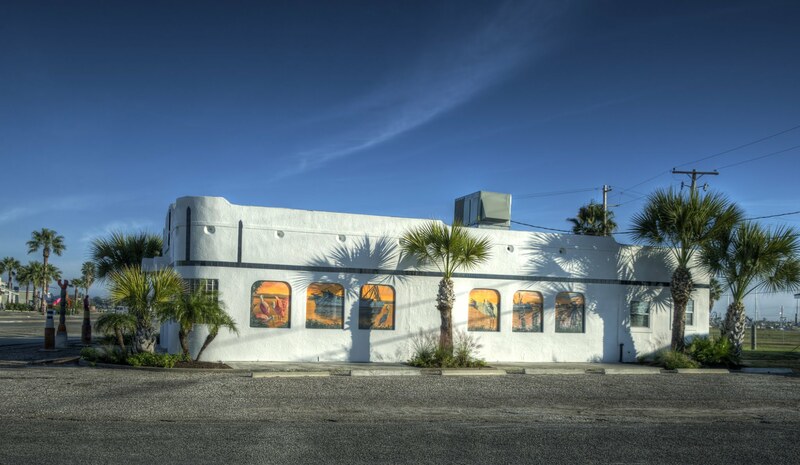 Roving Reporter | RCA | "Rockport Center For The Arts Takes Lead In Downtown Beautification"
The architectural fabric and the economic viability of the downtown area were severely eroded after the storm. The Rockport-Fulton Chamber of Commerce formed several economic recovery planning groups, one of those groups addressed downtown issues. 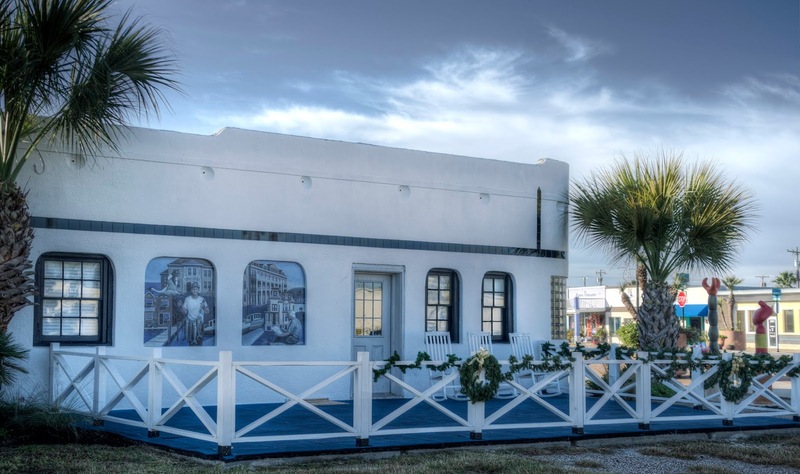 A major goal for the downtown Rockport group was beautification- with two key strategies being adding art and flora to the downtown landscape. 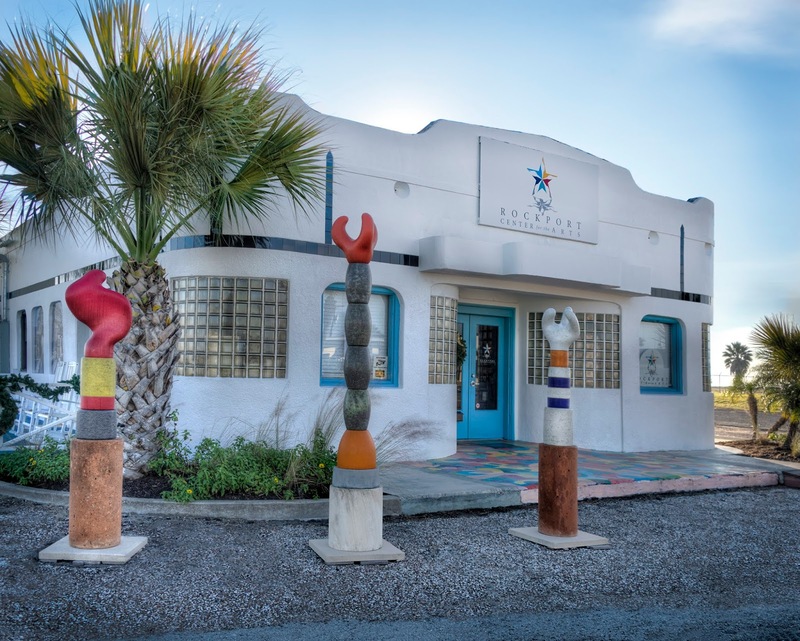 In the winter of last year, the Art Center contracted San Antonio artist Louis Vega Treviño to paint a colorful mosaic on the stoop of the building located at 106 S. Austin St. The mosaic was meant to add color too the street that had turned gloomy by the storm. In the spring the Art Center adopted the two City of Rockport planters that sit at the corner of S. Austin St. and North St. The Art Center worked with the City’s Parks and Recreation Department and Native Dave on a replanting strategy, by repurposing mature palms from the Art Center’s Navigation Circle location and adding additional colorful native flora. In the spring of this year the Art Center partnered with Bechtel, the largest construction company in the United States, and began a summer long rehabilitation of the exterior of the Art Center building. The project was significant. It involved painting the exterior of the building, replacing storm damaged windows, and protecting areas that once served as electrical fixtures that allowed water to enter the building during heavy rain. The project was successfully completed. An Art Center patron stated – “We love them. Especially at sunrise and sunset. The orange glow is truly amazing, it makes the murals come to life.” The new murals have drawn a lot of visitors to the Art Center. In early December, just one week later, the Danville Chadbourne triptych, which was damaged during the hurricane, returned to Rockport after a long conservation process. It now sits in front of the Art Center as it did at the location on Navigation Circle since its installation in 2016. Additional site work around the triptych will start in January, which will add further beautification. The Art Center is working on multiple sculpture conservation projects through new acquisitions. This fall the organization acquired artist Nic Noblique’s The Spirit of Rockport, a large blue powdered coated steel sculpture that until recently resided at The Daily Grind. Over the years, the piece suffered considerable degradation due to the harsh climate conditions of the Texas coast. It is due to return early next year, once conservation is complete. The Art Center is working with the artist, Noblique, and the conservator on an installation plan that will better protect the sculpture. In August of this year, the Art Center also completed the restoration of the Sculpture Garden located near the Rockport Harbor for fall and winter visitation. The five bronzes that reside there are scheduled to be cleaned and waxed in January of next year. “Art is part of Rockport’s heritage. The Art Center is the caretaker of that trust. We recognize how important it is for our community and its visitors to dwell and enjoy our beautiful coastal town at its best. We are very proud of our beautification accomplishments through the use of sculpture, murals and other forms of art. It has been a terrific year for the arts in our area. Next year, for our 50th anniversary, so much more is planned.” States Luis Purón, Executive Director. Additional sculpture projects, neon and a mural are in the developmental stages; more will be revealed as projects mature.